Few places match the mysticism and mountainous beauty of Mount Shasta. From retreat centers and hot springs to waterfall treks and breathe-taking views, this peaceful scene is packed with bliss. Nearly equidistant from San Francisco, Portland, and Reno, many road-trippers can reach Shasta in under five hours, making it an optimal weekend getaway. Heeding the call? Scope out these travel tips. Given the region’s multitude of affordable, tree-laden accommodations, there’s hardly an excuse for mediocre hotel stays. My vote goes to Stewart Mineral Springs for all-around serenity and convenience. Located 25 minutes from Shasta City, this retreat center is worth the drive. 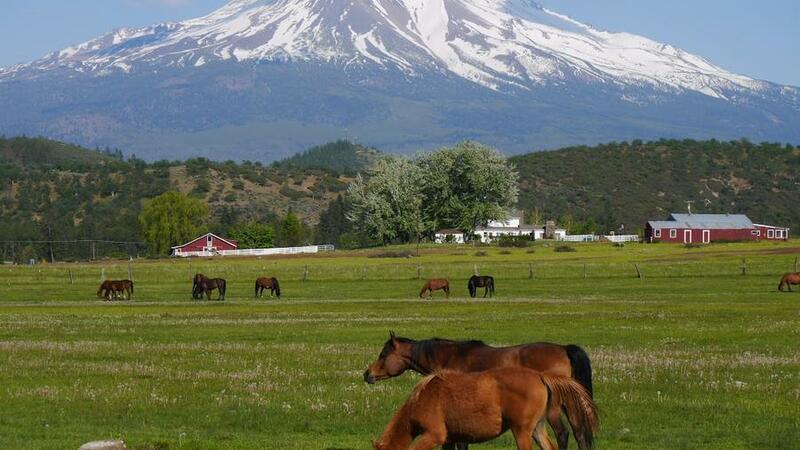 Guests are greeted with acres of grassy fields filled with galloping Arabian horses with Mount Shasta beaming in the background. Known for its healing waters, the retreat center attracts many visitors for its on-site mineral bath house, where patrons enjoy detoxing soaks, a wood-burning sauna, and brisk, liberating dips in the mineral stream. Those interested in local Native American traditions can try the sweat lodge on Saturdays. Travelers can dine at the on-site cafe, and take their pick between a teepee ($40), spacious motel room ($70), petite apartment ($80-$160), or full cabin ($90-$110). Even amidst California’s drought, Shasta’s waters generously flow. About 15 miles from Shasta City, lives the gushing triage known as McCloud Falls. The easy 4-mile trail passes the lower, middle, and upper falls with opportunities for summer swimming and picnicking near in the top. Too smitten to leave? Pitch a tent in Fowler’s Campground. Check out further details and directions here. Deemed the 8th wonder of the world by President Teddy Roosevelt, Burney Falls is a worthy pick for those open to the 50 mile drive from Shasta City. The 1.3-mile loop trail guides hikers to 129-foot twin falls, the culminating point of an underground volcanic aquifer. See directions and details here. Outdoor lovers seeking a mellow adventure local to Shasta City can enjoy a 7-mile stroll around Siskiyou Lake. Diners interested in a tasty brunch will drool over the benedicts, crepes, and frittatas at Lilys. Hikers looking for something hearty after their trek can venture to Lalos Mexican Restaurant. Yearning for a sweet treat? Grab an ice cream cone at Coffee Connection. A healing retreat wouldn’t be complete without stopping by the ever-popular, Soul Connections. This new-age mecca hosts spiritual trinkets, stone jewelry, and vibrant clothing with plenty more to peruse through. Looking for a little less zen and a bit more waterfront fun? Dip into Lake Shasta travel tips here.